Proper landscape maintenance service is key to maintaining your homes beauty and value. Even the most beautiful plantings and landscapes cannot flourish without proper maintenance. 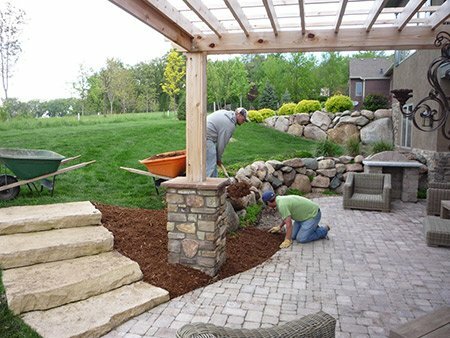 With the harsh weather and seasonal changes we experience in the Des Moines region, our landscapes require that extra special touch and care. In fact, a quality landscape design and installation becomes worthless when it is not maintained. Among other things, landscape maintenance takes time. We know you could use a little extra time in your life. Let us show you how easy life can be when you use our landscape maintenance service. Perennial plant maintenance including dead-heading, cutting-back and dividing-we keep your flowering plants looking their best all season. Floral Installations for spring, summer, fall and winter. We can add annual pansies, daffodils, petunias, impatiens, etc. to your planting beds for breathtaking color displays. We can even install container plantings to enhance your property. Many of our landscape maintenance clients enjoy our attention-to-detail so much, they have us manage other work at their properties such as exterior painting, outdoor lighting, fence maintenance, pool maintenance, you name it. For more information about our landscape maintenance services or to get on our spring schedule, call Earthly Possibilities today!